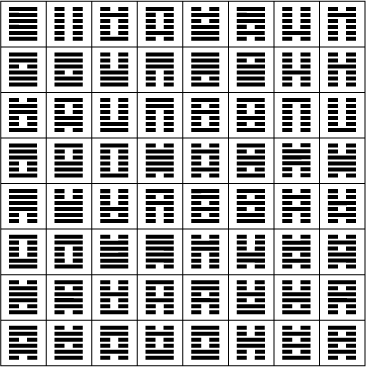 The I Ching itself began life as the Chou I, or Changes of Chou. It was the oracle of the Chou people, which they brought together at the time when they were working to overthrow the corrupt Shang dynasty. Brilliant research by Steve Marshall (published in The Mandate of Heaven) has evoked the social and spiritual turmoil of these times – and even suggested a date when a total solar eclipse gave the Chou king Wu his mandate to invade: June 20th, 1070BC. The Chinese I Ching, or Book of Changes in English, represents sixty-four archetypes that make up all the possible six-line combinations of yin and yang, called hexagrams.Yin/yang is the fundamental duality of the Universe whose dynamic tension gives shape to all phenomena and the changes they go through. 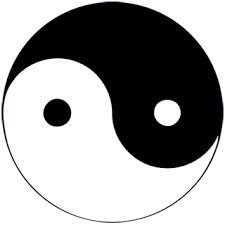 Examples of the yin/yang polarity are female/male, earth/heavens, dark/light, in/out, even/odd, and so on. The interpretations of the sixty-four hexagrams describe the energy of human life divided into sixty-four types of situations, relationships or dilemmas. Each hexagram can be analyzed in a number of ways. Divide the six-line forms in half and you get trigrams (three yin or yang lines) that represent the Chinese version of the eight fundamental elements: sky, earth, thunder, wind, water, fire, mountain, and lake. These eight trigrams, known as “Hua,” also serve as the compass points in the ancient art of placement known as Feng Shui (pronounced fung-shway). There is evidence of early Chinese divination where tortoise shells were heated over a flame until they cracked, with the emerging patterns (presumably trigrams) being read. In some cases the shells were marked with their interpretations and stored for reference, and I have had the privilege of seeing a few of them preserved at the National Museum in Taiwan, China. Another version also involving tortoise shells describes descendents of the “many Fu” — an ancient clan of female diviners — who read the shells of live turtles. According to the legend, they became the queens and royalty of the Shang Dynasty — which had been considered mythical until archeological evidence proving its existence was unearthed in 1899. Some say Lao Tzu, the enlightened forefather of Taoism and the author of the Tao Te Ching, was a descendent of this clan. The Taoist/Confucian tradition posits that juxtaposing a set of the possible permutations of yin and yang with elements of Chinese creation mythology produced the foundation of the I Ching. Pairing up the various combinations of yin (the literal ancient meaning of which is the shady north side of the hill) and yang (meaning the sunny south side of the hill) gives you four primary symbols. With the addition of another yin or yang line, the eight trigrams emerge. The Book of Changes was canonized and studied intently by scholars during the Han Dynasty of 202 B.C.–A.D. 220. Between the third century B.C. and the turn of the millennium, significant additions, known as the ‘Wings’, were written regarding the individual lines in the hexagrams, and the meaning of the trigrams. These commentaries are generally attributed to Confucius, who lived around 500 B.C. 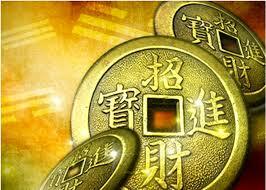 More work was done, and the I Ching we use today is not substantially different from the 168 B.C. version. The main difference is that the hexagrams appear in a different order. The order in use today was first proposed around 100 B.C., but was not the standard until the third century A.D. Throughout what we know of Chinese history, the rulers of China, as well as the general public, used the I Ching as best they could before printing was available. It is woven into the fabric of this ancient culture and its influence has been fundamental to the Eastern worldview as a whole. It has only been in the last 150 years or so that Western culture was even exposed to basic Taoist concepts — such as German and English translations of the I Ching and Tao Te Ching. Carl Jung’s explanation of the I Ching’s psychological validity and value, and the widespread open-mindedness about all things spiritual during the 1960s, made using the I Ching a common experience in the Western world. Next How Important are Your Dreams?